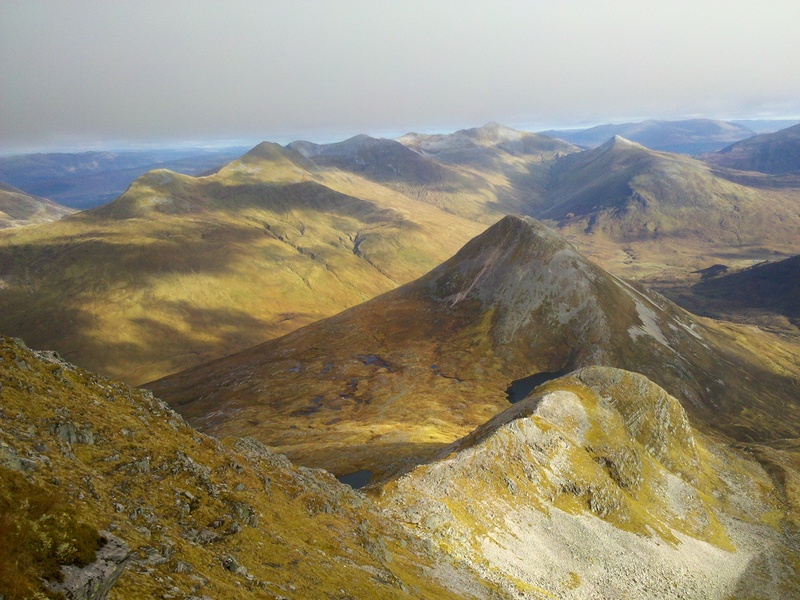 An excellent day's walking in the Mamores, taking in three Munros (two of which were new ones for me). After an evening train journey up to Glasgow last night, I arrived at the Premier Inn that I had booked to find that it was very new, having only been open since Monday! I sorted out my backpacking gear and headed to bed. This morning I made an early start at 6am, dropped off my non-backpacking stuff in the luggage room, and wandered across the road to catch the first bus of the day to Fort William. A three hour bus journey then followed, with intermittent snoozes and also some spectacular views at times! I arrived into Fort William just before 10am and after a quick trip to the supermarket for last minute supplies, I got a taxi up Glen Nevis to the Lower Falls carpark, which was the starting point of my walk today. The first half hour or so was relatively easy on gentle angled forest tracks. After that I picked up a newish looking path up through an area of felled forest. Around now it began to drizzle; however this was relatively short-lived and also resulted in an impressive rainbow above the glen. Soon it was time to leave the woodland, and the good path at a stile onto the boggy open hillside. 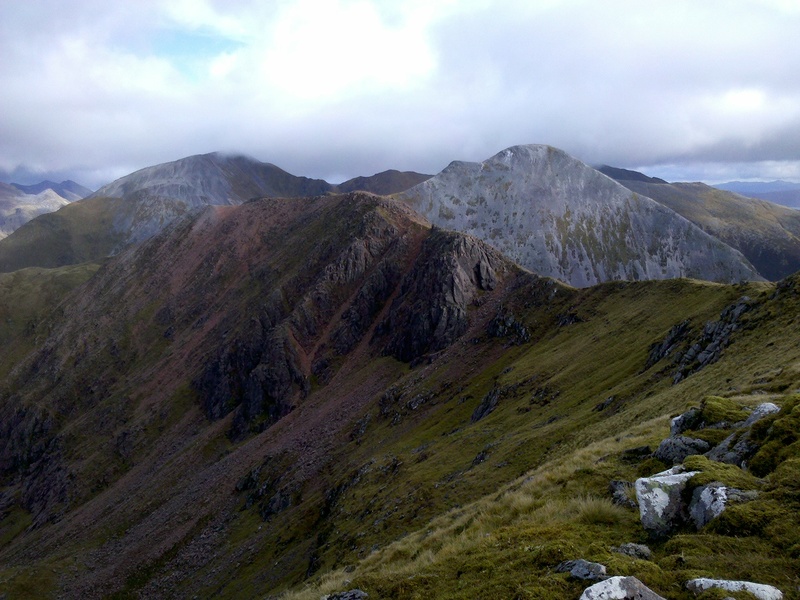 I headed steeply up onto the northeast ridge of Mullach nan Coirean. The ground improved as I ascended, as did the weather resulting in fantastic views :-) I continued up the well defined ridge, which became rockier higher up around the time I entered the cloud, which was hanging at around 800m. Just before 1pm, I reached the summit of Mullach nan Coirean (Munro) a little short of two and a half hours after leaving Glen Nevis. Whilst I was having lunch in the shelter of the summit cairn, the cloud suddenly lifted to reveal a most impressive view across Loch Linnhe and over to the hills of Ardgour. A couple of other hill walkers arrived just as I was about to leave, so I wished them a good day and descended along the ridge whilst admiring the views of where I would be heading next. The undulating ridge headed over the southeast top (Munro Top) and the east top (Corbett Top), and past a few other walkers, to reach the impressive quartzite peak of Stob Ban. The wind was strong enough to make it chilly at times, but not so strong as to cause any balance issues! I reached the summit of Stob Ban (Munro, Marilyn) at around 2:30pm, and it was here that I first had my doubts as to whether I was going to have enough daylight to complete my planned route for the day. The descent from Stob Ban was steep and tricky to start with, but soon I was on the pleasant east ridge down to the bealach from where there were good views down towards Glen Nevis and southwards towards the West Highland Way. A short, sharp ascent brought me to the summit of my next hill: Sgorr an Iubhair (Munro Top), which I reached at 3:45pm. It was now clear that I was somewhat behind schedule, so I opted to skirt the next peak, Am Bodach to the north by way of a stalkers path. As I traversed I could hear stags roaring in the corrie below. Around halfway through the traverse I came upon a pleasant surprise: an unexpected stream! Taking the opportunity to collect water for my camp, I filled up my containers with three litres; now I would be able to camp up high on the ridge whenever I fancied. 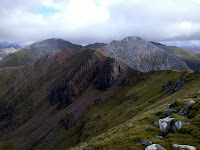 A pleasant ridge, over the south top (Corbett Top), brought me to my third Munro of the day: Stob Coire a' Chairn (Munro, HuMP). The views were excellent from up here and I could pick out most of the main peaks in Lochaber. However it was now 5:20pm, which left me with only 1-1.5 hours of daylight left. A summit camp would have been nice, but it was too stoney here. Therefore I continued along the ridge to the ESE, where I soon came upon a flat grassy area with excellent views. This seemed like an ideal camp spot, so I got the tent out and just about got it pitched before a squally shower arrived! Once the shower had passed, I reopened the tent to admire the excellent views whilst I boiled water using a convenient rock in porch as a table! Dinner was couscous, which I ate whilst listening to last nights News Quiz. The temperature dropped significantly once it got dark and I was soon tucked up warmly in my sleeping bag for the night. A wee dram of Glenlivet and a hot chocolate then followed, whilst I caught up on some of the other outdoor blogs that I follow using an offline reader on my phone. N.B. At some point during the next week I will be editing this post to include more photos and a route map of the day's walk. Post updated on 11/09/12 to include route map, photos and links to hills; post date also altered to actual date of walk (from 07/10/12).